Paulette Ngachoko, a native of the West African nation Cameroon, is on a mission to showcase the foods of her homeland. 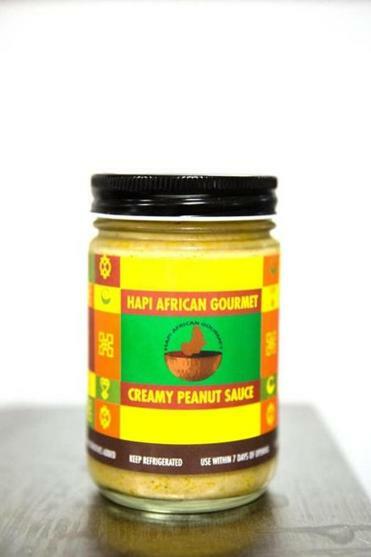 Last year she launched Hapi African Gourmet and introduced her first product, Creamy Peanut Sauce ($8 for 13.2 ounces). The savory sauce is simmered with peanut butter, vegetable broth, garlic, celery, herbs, and spices. It is unlike Thai peanut sauce, which is usually blended with soy sauce and lime juice or rice wine vinegar. Typically served over rice, it’s used to simmer chicken and fish or swirled into stews and soups and drizzled over bread and plantains. Ngachoko came to the United States two decades ago as a refuge after spending four years in Burkina Faso in West Africa when she was forced to flee the turmoil in her country. With two law degrees, one from Boston University, she worked for nonprofits as an advocate for reforms in African countries until the funding for her programs ran out. A passionate home cook, her American friends clamor for her dishes, which swayed her to start the company. “I want to show another side of Africa,” says Ngachoko. She kicked off the business with peanut sauce, she says, because peanut butter is so familiar. Other selections will eventually follow. “Many people don’t know that African cuisine is varied and versatile and high quality,” says Ngachoko. Available at Pemberton Farms Marketplace, 2225 Mass. Ave., Cambridge, 617- 491-2244; The Spirited Gourmet, 448 Common St., Belmont, 617-489-9463; Volante Farms, 294 Forest St., Needham, 781-444-2351 and Wilson Farm, 10 Pleasant St., Lexington, 781-862-3900.